Australian Nick Morris decided early on for a career in art – at around the age of 6 to be exact. Somewhat deterred by the possibility of not making it into the 2% of artists who make a living off ‘it’, he opted for a career in Graphic Design. He started out at Chisholm Institute in Caufield. Here he met fellow designer Dave Bowers with whom he set up a clothing label ‘Umgawa’. A successful initial run ended with their inexperience catching up with them. Next up was a dream-fulfilling stint as Art Director at Quicksilver, Toquay. Followed on a few years later by the set up of ‘Anyhow’, a freelance graphics company serving the streetwear industry. The business peaked around 2004 when we were invited to speak at Semi Permanent graphics conference in Sydney and then later at Agideas with a host of international designers. Also around this time, so some 20 years later from starting out as a graphic designer – a small exhibition in Torquay and some insistence from friends initiated the change in direction to what would become work as a full-time artist. Bowing to his friends bidding he created for the exhibition a series of paintings. 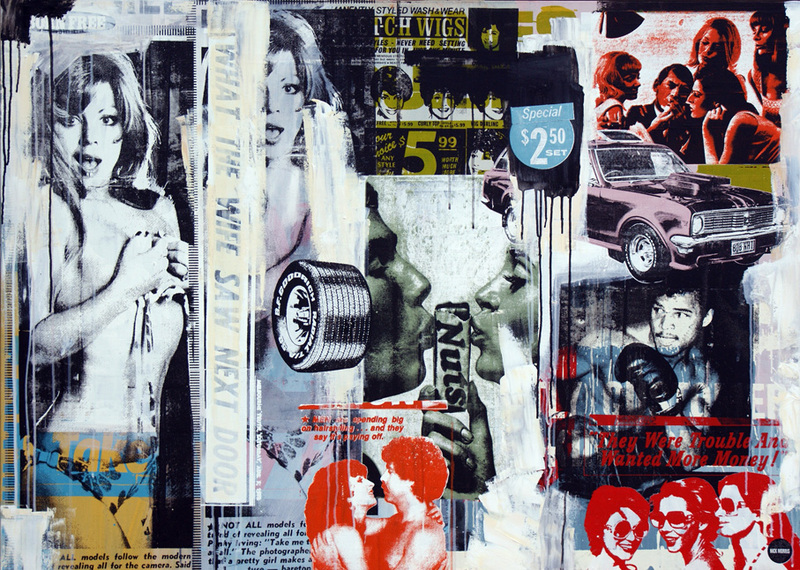 He utilised some screen printing techniques he acquired during his years as a graphic designer and a dash of Andy Warhol inspiration. The process reignited a passion for art. It took several more years of hobby-esque painting time before he took further steps to establish himself as a full fledged working artist. In the beginning he reduced work to 3 days a week and concentrated on painting the rest of the time. But after a few sold-out shows Nick fulfilled his ambition and entered the domain of the exclusive 2%! My art is the Australia that I grew up in and live in and that is the theme thats most important in my work. The most inspiring part of my working process is the immediacy of screenprinting. The instant gratification of it and not knowing what is going to happen as the images collide until you lift up the screen. I’m am not sure that I have a strange talent but I love screen printing and have ever since I was a kid and that has definitely influenced my work. Having spent 20 years as a graphic designer has allowed me to utilize the skills I picked up along the way to create screens and separations along with a fair apprenticeship in design, colour and balance of each piece. I would love to work with Raushenberg or Warhol. I love what they achieved along with their work. I would love to spend time with them so that there success and creativity could rub off on me. I think with my work that what you see is what you get, so there is little room for it to be misinterpreted. I would love to decorate the Sydney Harbour bridge. Some sort of giant paste up would be ace. Being shortlisted for the Doug Moran prize was probably the Cherry on the cake to date along with every time I have a sellout show. Waking up every day and painting also rates right up there. That is heaven on earth. My artistic style has stuff all to do with my underwear at this point in time. Perhaps one day I will have my own range of underwear! !